Ten air operators have either cancelled or diverted flights from Bristol Airport in a row over runway safety. Thousands of passengers have been affected, with a total of 98 flights diverted and 28 cancelled, after claims aircraft had skidded on landing. Airport bosses have insisted the runway has a "clean bill of health" from the Civil Aviation Authority (CAA) and it will remain open. Flights are being diverted to Cardiff, Gatwick and Birmingham airports. The affected airlines are: Easyjet, BA Connect, XL, Thomsonfly, Thomas Cook, Balkan Airlines, First Choice, Air Malta, KLM and SN Brussels. Easyjet withdrew its planes on Friday over concerns its planes skid when landing in wet weather. Passengers on nearly 40 Easyjet flights on Saturday are being transferred to Cardiff airport, while all the other services by the firm have been cancelled. All First Choice and some Thomas Cook flights have been moved to Birmingham Airport. Other Thomas Cook flights are being diverted to Gatwick Airport. 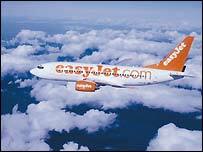 A spokeswoman for Easyjet said: "We are operating 60% of the Bristol operation out of Cardiff but we are suffering delays of around three hours because passengers need to check in at Bristol first. "We need to get the message out that travellers need to check in at Bristol first of all because people are turning up at Cardiff directly." Peter Philips, spokesman for Cardiff Airport, described the scene at the airport as like a "busy summer's day" and said diverted flights were being delayed by just over an hour on average. Around 7,000 extra passengers were due to use the airport on Saturday and Mr Phillips said he expected the arrangements to remain in place until Monday at least. 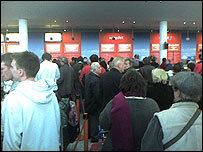 Easyjet say a decision on Monday's flights has not yet been made. The row developed after £17m of resurfacing work on the runway. Tony Hallwood, the airport's Aviation Development Director, said: "Over the past 24 hours we have been working with our airline partners to find an acceptable way forward. "We wish to reassure passengers that every effort is being made to ensure that a normal service is resumed at Bristol International as soon as possible." Easyjet said it is concerned grooves have not been cut in to the new surface of the runway, which has affected braking distances of planes. Mr Hallwood said: "The runway is presently grooved, there are just certain areas where we need to maybe look at enhancing that grooving and we're working very very closely with our engineering team." Shaun Robinson, from Thomas Cook, told BBC News 24 the CAA cannot give out the information pilots need to land safely because the airport cannot supply them with reports on braking. He added that none of his pilots had reported problems with landing. Astreus, Aer Arran, Ryanair, Air South West, Aurigny, Continental and Flybe are still flying from the airport. Peter O'Donovan from Aurigny, said they were still flying as they use smaller aircraft which do not need such a long landing strip. We were due to land at Bristol airport from Amsterdam on Friday afternoon. We were diverted to Gatwick, where our troubles started. The staff at the EasyJet office at Gatwick were not expecting any of us to arrive and then to expect onward transportation to Bristol airport. They seemed to be unaware of the issues at Bristol, and had to make several phone calls before someone could tell them what was happening (though we seemed to know more than they from the BBC website). They refused to compensate us if we took a taxi or hired a car. Amid complete confusion, they eventually got a coach to take us to Bristol some four hours after our arrival, which then subsequently broke down while still in the terminal. After landing at Gatwick at 4:15pm we arrived in Bristol at 12pm. Good bits: Flight to Edinburgh was cancelled and I felt website gave reasonable notice and a warning email. Bad bits: 0871 number clogged up and after navigating the automated system you were advised to contact a specific number 0871 244 2399 - so back to square 1. The website indicated that there was an online form for refunds in the case of cancellation in their "contact us" section. I could not find it and was pointed back to the original 0871 number. Poor customers and poor Easyjet phone operators whose stress levels are wound up by pathetic central mess ups. My flight from Edinburgh to Bristol was diverted to Birmingham on Friday afternoon due to "fog", then a coach took nearly three hours to take us to Bristol airport, making the door-to-door journey time nearly seven hours! I'm meant to fly back on Sunday evening, though I'm already looking at alternative arrangements as by the sounds of it the disruption is due to continue for the next few days. As with a lot of passengers, most of our information came from radio stations and taxi drivers! We were delayed by over three hours on our way out to Geneva from Bristol (Easyjet) and now we are in Geneva airport on our return leg, and are delayed again by five hours. This has ruined our holiday, meant we incurred extra expense and the measly voucher offered didn't even cover a cup of coffee or a beer, either at Bristol or Geneva. Totally unacceptable all round, especially with small children in tow. We are a party of 13 returning from a skiing holiday and are currently at Grenoble Airport. It is complete chaos. Not enough seats or food, people everywhere. There are people standing five deep at the bar. Easyjet have still not confirmed that we can't fly to Bristol. We only know about the disruption at Bristol Airport through the internet and calls from home. Easyjet have not made any attempts to contact us despite having contact numbers. The flight is at least three hours late. They have not issued any food/drink vouchers as yet. We have been at the airport since 10am with eight children in tow. The possibilities of keeping them entertained, fed and watered are limited! I had my flight delayed today, the helpline was rubbish. The only information I got was an email from Easyjet explaining that they wanted more money from me for flights in the future because of an extra fuel charge.